[One of my followers sent me this fascinating note. He had indeed found something I was looking for. Here’s his note. You can download the PDF as I did. This relates to the Temple of Solomon article which I had found as a result of my diggings into the sources for The Great Jewish Mask. I should add, that IF Jesus existed, then the answer to what race he might have been might be as per below. But keep in mind that Jesus might never have actually existed. Do not take it as "a scientific fact” that Jesus actually existed as a real person. That is a whole different line of questioning. In The Great Jewish Mask I had mentioned The Temple of Solomon and the article that mentioned Jewish art and how absolutely pathetic it was. It was in this magazine that I found the exact quote, word for word that was used in The Great Jewish Mask in 1936. In this magazine you’ll also find the full copy of The Temple of Solomon article. This magazine has many articles about Christianity, the Bible and even evidence of human sacrifice found in Israel. I should mention that Christians do some things without really questioning it carefully. There is for example the time when they have bread and wine in Church and when they “drink the blood of Christ” and “eat” of his body. These may be references to human sacrifice and cannibalism that has found its way into the Christianity and yet Christians never ask themselves why they are “drinking the blood of Christ”. Just finished listening to your four part series, The Great Jewish Masque. I enjoyed it very much. Thank you for all of the hard work and effort you put into your videos and web sites. I think it was in part four of the series, you referenced an article from a 1909 issue of the the magazine, The Open Court. The article was entitled, The Temple of Solomon, by Phillips Osgood. As a side remark you mentioned an article title in that same issue that was listed in the table of contents, titled, Was Jesus an Aryan? and you expressed your desire to read that article but your copy of The Open Court only included the front cover and The Temple of Solomon article. If you are interested, I found a pdf copy of that issue of the magazine at archive.org that includes the article about Jesus. The link is https://archive.org/details/opencourt_aug1909caru. It’s a very short article consisting of only three paragraphs. Hope that helps a little. Here, from page 504 of the PDF is the article. In our opinion, there can be no question but Jesus was a Galilean by birth. the Galileans were a people of mixed blood. 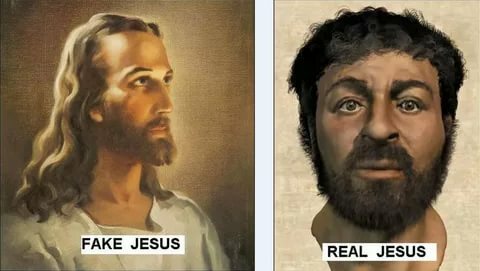 [T[The above images of Fake Jesus and Real Jesus come from a modern scientific study of what Jesus would have looked like, based on what we know. So in conclusion of the author above, if Jesus existed then he would have had a bit of Aryan blood in him, but he could not have been a pure Aryan (white). So by South African standards Jesus would have been some type of coloured. ← VERY IMPORTANT: An EXTREMELY weird fact about Zuma’s resignation – Who came to scare him?